Today The 74 Million published an article of mine on Positive Behavior Interventions and Supports (PBIS). In order to get all the good data and interviews in, some stuff had to get cut, so I’m publishing it here. Northside ISD wasn’t the only school district where I went looking for restorative justice practices. Four San Antonio districts received grants from the U.S. Department of Education to build PBIS systems or something similar. It really took off in NISD, even though their initial grant was by far the smallest of the four. Southside ISD has had a smaller rollout, South San’s program is not getting the rave-est reviews from students, and San Antonio ISD’s is uneven at best. However, within SAISD and NISD I discovered that Communities in Schools was off and running with restorative justice practices, and I was able to visit with some of the rockstars behind those efforts. Their story is below. 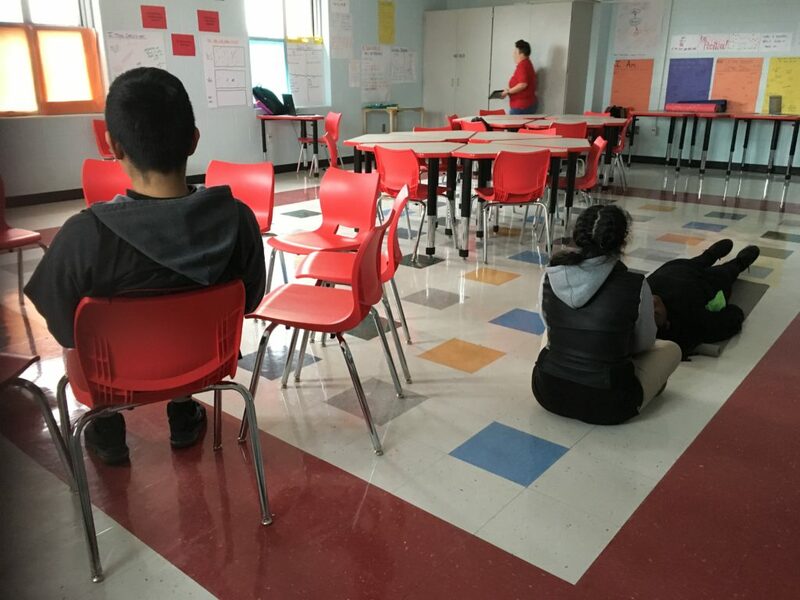 CIS Site Coordinator Maggie Moreno walks students through meditation at Davis MS.
Communities in Schools-San Antonio, a nonprofit working with students who face significant obstacles, has helped several NISD and San Antonio ISD campuses take PBIS a step further. Julia Robinson-Harris was a CIS-SA site coordinator for Rayburn Middle School in NISD when she began working with restorative discipline practices. It started with one class, instituting what is known as “circle,” where students and their teacher sit together and discuss current events, schoolwide issues, classroom dynamics, or anything else that might be weighing on students’ minds. The teacher must participate just like the students—listening, expressing feelings, and sharing concerns. Eventually, this method is used to “repair harmed circles,” or to mediate interpersonal conflict. Students who are comfortable expressing their feelings and connecting their feelings to facts, Robinson-Harris explained, are better equipped to restore relationships and ease conflict. Marie Moreno is the CIS-SA site coordinator at Davis Middle School in San Antonio ISD, and she too has started helping teachers lead circles when they feel like the class is emotionally out of control. Many times, Moreno said, it’s hard to get the teacher to trust the process. “One of the most difficult things about restorative discipline is the buy-in of the teachers, the administrators, the district,” Robinson-Harris said. Restorative discipline takes time. Time away from class, time away from test prep, and it’s results are not instant. “When they don’t see the immediate results (some) get disheartened and give up,” Moreno said. However, enough have stuck with the practice to see it gain traction. Restorative discipline has also won some friends in high places. Texas Education Commissioner Mike Morath has been a proponent, as well as Carole Harle a prominent San Antonio educator and NISD trustee. Robinson-Harris is now the restorative discipline coordinator for Region 20, where she trains staff and helps districts across South Texas build programs at their schools. Katherine Perez works with the Southside ISD PBIS team, and brought up another strength of the relational models. “Many of our students have experienced trauma,” Perez said. Of Southside ISD’s 5,700 students, 81% qualify for free and reduced lunch, the federal proxy for poverty. The link between poverty and trauma is strong. Some researchers say that poverty itself is trauma. Others have shown that children living in poverty are more likely to be subjected to traumatic experiences with long term effects. With this in mind, CIS-SA also has a field manager trained in trust-based relational intervention, Tara Lazaro. This method, which originated with researcher Karen Purvis at Texas Christian University, is “more clinical” than PBIS, Lazaro explained. In her work with CIS-SA’s SAISD and NISD middle schools, Lazaro helps teachers and staff understand what happens in a child’s brain when they are stressed or traumatized. The cortisol hormone actually alters the way their brain receives information. She also helps identify calming techniques that can work within a given school setting. Some schools have “calming rooms” where students can go calm down. At Davis Middle School, Moreno uses meditation to help students calm down. She finds YouTube channels with free meditation tracks, and plays them as she guides the students through yogic breathing. The kids can lie on yoga mats, hold “fidget toys,” or even fall asleep throughout the meditation—whatever helps them feel calm and in control of their own emotions. She tries to find tools they can use at home to create calming spaces. While TBRI is “more clinical” than PBIS with its avatars, campus currencies, and lunch passes, the goal at the heart is the same: a relationship. It’s the relationship that the child needs to flourish, and that relationship requires time and trust. SAISD asked business leaders for support. They delivered. Here’s what that means…and here’s what it doesn’t mean.